The FlightSuit Bird Diaper has us speechlessed. The idea, of course, is you strap it on and protect your home and loved ones from unsavoury droplets of bird goo, but we can’t get around the fact that someone sat down and seriously thought this one up – and then went out and persuaded some shmoe to manufacture it. Just when you think you’ve seen it all….wow! £24.99 (disposable FlightLiners are extra…right, gotta go lie down for a while). This reusable bird diaper collects droppings in the patented poop-pouch and keeps droppings away from you and your bird anywhere, anytime. With FlightSuits, your bird can enjoy more out-of-cage time without the mess, inconvenience, and embarrassment of soiling your clothing or furnishings. * Does not impede flight. Non-restrictive, comfortable design allows wings, neck, and feet maximum freedom. Nigel is the managing editor of the Red Ferret, as well as a freelance columnist for the Sunday Times newspaper in London. Loves tech and fancies himself as a bit of a futurist, but then don’t we all? Nigel – who has written 6610 posts on The Red Ferret Journal. Speaking of bizarre animal-wear, I was recently introduced to the phenomenon of 'Soft Paws' [ http://www.lasplash.com/uploads/2/Soft_Paws-4_2.j…], which astounded me somewhat. 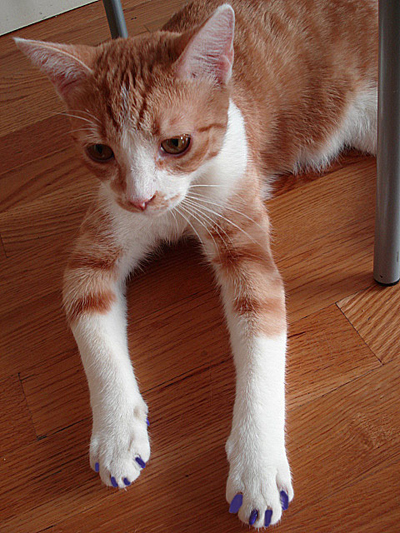 Still, I suppose it's preferable to declawing them. I saw someone using this with her bird once. This is a totally good idea.